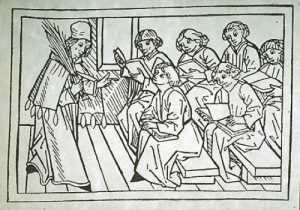 Illustration of a classroom with students reading and learning from a teacher standing in front of the class. As the faculty is a key resource for the Department, we aim to mentor and promote faculty members in a timely fashion. The university has specific tracts that have separate processes for advancement. The Department hopes to ease the process of advancement for each faculty member by having an ongoing faculty development committee, whose members change as the need arises. Set up a regular and effective means of monitoring and fostering individual career development. Provide a systematic, coordinated program to help faculty identify, focus on, and achieve their individual career goals. Establish guidelines for expectations for the faculty as well as for their mentors and division chiefs. The Faculty Career Development Committee will review individual faculty development and will help guide and support faculty members. Each faculty member at the Assistant Professor or Associate Professor level will select a mentor within the Department. This does not preclude having multiple mentors. Faculty members will have an annual review by the Faculty Career Development Committee. The Department and Divisions will continue to provide the infrastructure necessary to facilitate individual, divisional and departmental goals. The Mentor should meet with Faculty Member (Mentee) every 6 months at a mutually convenient time. Prepare for a formal committee review about once a year. See suggested format below for the Mentor-Mentee meeting prior to review. Prepare for a formal committee review about once a year. See suggested format below for the Mentor-Mentee meeting prior to review. Mentor: Return Final Copy of Annual Report (+/- letter at your discretion) to Dr Shockley prior to scheduled FCD Committee meeting, Email is preferred.